Our eyes met from down the street. As he quickened his pace toward me, my heart began to race. With his tongue hanging out his mouth, he nearly pummeled me to the ground as he bolted down the block. It could have been love at first sight, but my racing heart spoke more of worry, because in the last hours of an overcast night I had found a stray dog. It’s a situation that’s likely happened to many of us. Where did this four-legged furball come from and what should you do with him? In the sprawling avenues of Los Angeles, abandoned, abused or runaway pets are a growing concern for animal-lover Martha Wyss. A founder of the Friends of Animals (FOA) foundation, Wyss has been dedicated to rescuing, rehabilitating and relocating thousands of animals since 1983. The FOA kennel is, happily, a no-kill shelter, where dogs and cats receive immediate medical attention, including spaying, neutering, behavioral assistance and passionate affection. In some cases, guardians will surrender their pets, no longer able to provide them with optimal care. In other scenarios, pets are rescued from unbearable living situations. In either case, these pets congregate at the kennel where they begin their rehabilitation process. Though some of these creatures may be old, badly abused, blind, seriously ill, injured, pregnant or otherwise traumatized, FOA is dedicated to saving as many unwanted animals as possible. The foundation advocates quality placement of these creatures, and thus implements an application process to ensure an appropriate match of companion and potential guardian. All animals are personally delivered to their perspective homes where compatibility between animal, guardian, and environment can be observed and assessed. Once the situation is deemed acceptable, the new guardians sign and agree to assure the animal’s welfare. As a lifelong promise to each animal, Wyss and associates do their best to ensure each critter will be protected, loved and never again forsaken. 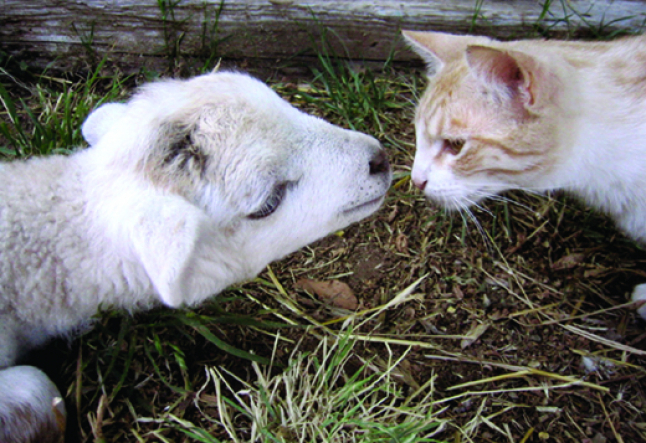 Pet adoption, when orchestrated by caring foundations such as FOA, helps create a more peaceful life for all creatures. However, in the growing global community, animal rescue extends beyond cats and dogs. Rescued from the abuse and malnourishment of factory farms, stockyards and slaughterhouses, Lorri Bauston’s Animal Acres provides sanctuary to rescued livestock. Providing medical attention and care to over 150 chickens, turkeys, cattle, pigs, sheep and goats, this refuge in Acton has pioneered the farm sanctuary movement. When Bauston moved from New York to the West Coast, she brought along with her ambitions of rescuing and protecting creatures objectified by the food industry. Volunteer-based Animal Acres aims to spread awareness of the plight of food production animals through special events and outreach programs. Every Saturday is Farm Chore Day, where volunteers partake in cleaning projects, painting, gardening, grounds maintenance and other tasks. Additionally, public tours are available each Sunday so animal lovers can spend a little one-on-one time with some four-legged (or winged) friends. At Animal Acres, hens that had previously spent their entire lives laying eggs in small wire cages share an open-sky haven with cows and pigs that had been beaten and kicked through livestock auctions. Either rescued during Animal Acres’ undercover cruelty investigations or other humane enforcement agency search and rescues, all animals receive refuge for the remainder of their natural lives. As these organizations work toward a better tomorrow for all living creatures, it is important for us to remember that all animals are beings with a full range of feeling. To these sentient souls we must extend our compassion as we develop our own consciousness and awareness of the world’s realities. By returning your found stray to its caring owner, adopting a once unwanted pet or visiting/volunteering at a farm animal sanctuary, you can continue to explore your wakefulness, playing your part in mindfully constructing our futures.